Olympic spirit delivers new sustainable team command centre just twelve months after Britain’s top sailor formed his team to challenge the US for sailing's greatest prize. McLaren did it in Formula 1. Team Sky did it in cycling. Now with the opening of his new racing centre in Portsmouth Sir Ben Ainslie has set out his intent to dominate the yacht racing world with a new level of professionalism. 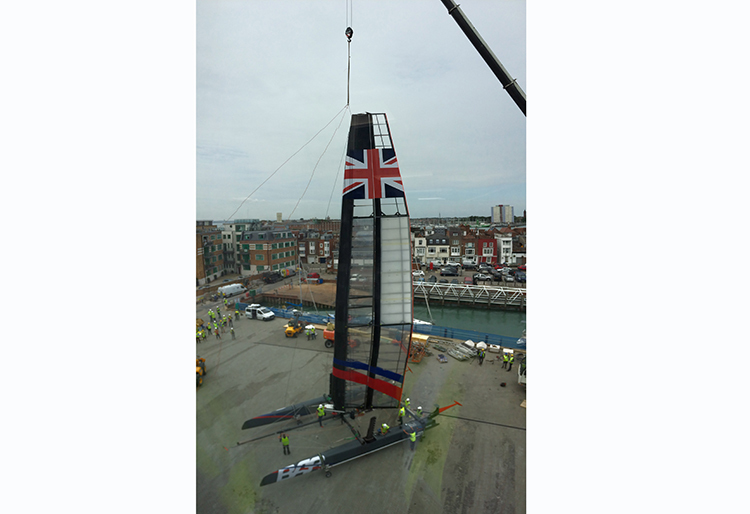 And that intent started with the construction team which is now preparing for formal handover of the £15M Ben Ainslie Racing (BAR) team base for boat design, racing command and commercial activity just over year since the team was officially formed to challenge for the 2017 America's Cup. Invoking the post-2012 London Olympic can-do attitude, the construction project, led by former Capita Symonds chief executive and one time pro-sailor Jonathan Goring, has moved from planning application in June 2014 through design, procurement and construction to deliver a BREEAM excellent structure purpose built to meet the team needs. “We really have not been precious about process,” explained Goring describing the speed of delivery as “insane” by normal construction standards. Goring was speaking at a special preview of the BAR team base with construction partners who, he explained, had gone beyond the normal call to ensure that this project was not only completed to its ultra-fast schedule but that it was also a quality built underlining the serious intent of the team to bring home the America's Cup trophy for Britain. Lady Georgie Ainslie, wife of Sir Ben and interior designer for the project, highlighted the critical role that the new base and the teamwork that has been used to deliver it, played in the race campaign. “No other team has anything like this,” she said referring to the fact that the sailing, boat design and commercial teams were all in the same space working and bonding together. It sent out a statement of intent to the competitors, she said, about how seriously this campaign was being taken, adding: “The team is in a mental battle as much as anything else”. One of the drivers for speed of construction is the fact that alongside the building design and construction, the team has also been working flat out to design, construct and test its series of new AC45 foiling catamaran race yacht prototypes ahead of the America's Cup Qualifiers in 2017. The so-called T1 prototype (pictured) with its futuristic articulating wing sail is already well into its trials to prove the design and train the crew ahead of the next generation and significantly more powerful T2 craft which will be ready for trials next month. 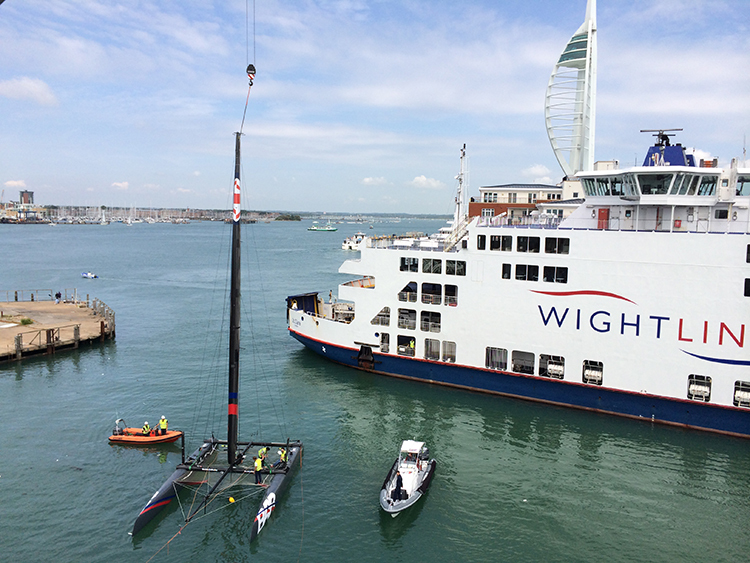 The base will become the hub for these trials ahead of the America’s Cup World Series which kicks off in Portsmouth next month. It will also be the training centre for the sailing team as it prepares and develops the boats through to the America's Cup Qualifiers in 2017 when BAR will battle for the right to challenge the Cup holder US Team Oracle in Bermuda. The team developing the base includes HGP Architects, main contractor Allied Developments, structural engineer Reuby and Stagg and environmental consultants Couch Perry Wilkes. Fit out is by Overbury and glazing by Prism. BAR was awarded £7.5M of Government funding towards the base construction. Creating a sustainable team is at the heart of the BAR Team ethos and sustainability manager Susie Tomson, a veteran of the London 2012 build team, pointed out that the whole project provides a great opportunity to show how the appreciation of embedded carbon, waste minimisation and working with environment can deliver lower cost, better solutions. “We could have gone for a crinkly tin shed or an all singing all dancing low carbon design. In fact we chose to go somewhere in between,” explained Tomson, pointing to the use of photovoltaic and rainwater harvesting boost the self-sufficiency of the structure and the engagement of the users, construction team, community and the environment to raise the BREEAM rating. 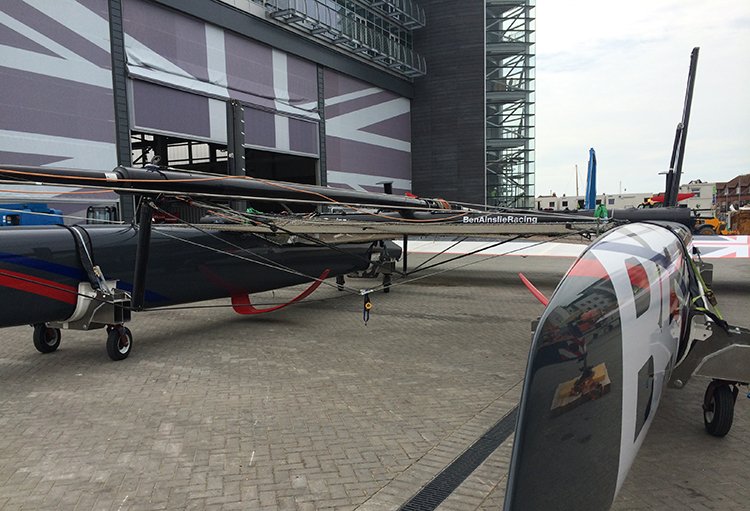 The base features a fabric roller shutter door on which the team claims the largest ever Union Jack has been printed. The final phase to complete the base will see a further fabric wrap added to the exterior of the façade between July and October, acting as both an architectural feature and a thermal insulation layer.